Hmmm...I'm sure I remember how to do this, right? It's been a LONG two years since I last posted. I'm really going to try hard to get this going again because I really did enjoy doing it. Life, in the form of a pretty little girl, go in the way and life has only picked up speed. But...I will still give it a go! 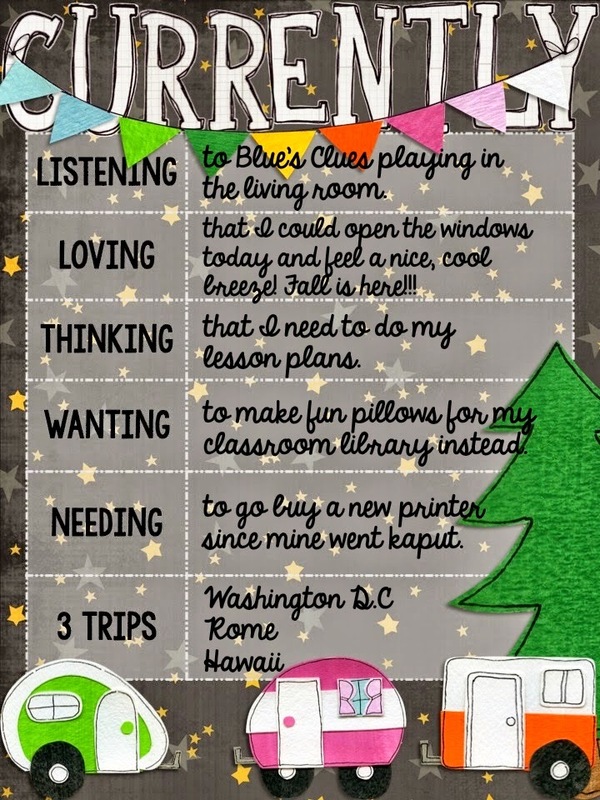 So...to get me started, I am linking up with Farley over at Oh Boy Fourth Grade for her September Currently. Listening - Emmalyn recently discovered Blue's Clues, so we recorded several episodes for her. The best part today was walking into the living room and seeing my almost 11-year-old watching it. Loving - The weather has changed here in central Colorado, and I am sooooo happy! I love opening my windows and feeling a nice, cool breeze. Thinking - Gah. I need to do my lesson plans. Every week I say I won't put it off until the weekend, but alas, I do. The only thing that prevents me from doing them at midnight on Sunday nights is that our principals want to review everyone's by noon on Sunday. Don't get me wrong...I have an entire plan for the week in my head. But organizing them into plans is mega-time consuming. I am a perfectionist, after all. Wanting - I've been looking at the awesome material I bought to make pillows for my library. It's been sitting on my craft table for over a month now. I.MUST.DO.IT.TODAY!!!! 3 Trips - I lived in Europe for 3 years when my husband was stationed in Germany, so we've been to the "big ones"...Paris, London, etc. But I would LOVE to go back one day. In the meantime, I would love to go to Washington D.C.. We wanted to wait until the boys were older to go, but now we have E to tag along, so we might just have to bite the bullet and go one day soon before they all grow up! And last-but not least-Hawaii! I think the challenge is getting everyone there. I want to take the kids with us, but we have one who has MAJOR flying anxiety for some unknown reason. I'm hoping he outgrows it. Well...here's to a nice weekend and hopefully the relaunch of my little blog! Hi Lori! I lived in DC for 2 years. Are you military? We are. Welcome back to blogging! It's like riding a bike… you'll always remember how! I'm moving close to D.C. next month, if you head that way, let me know!